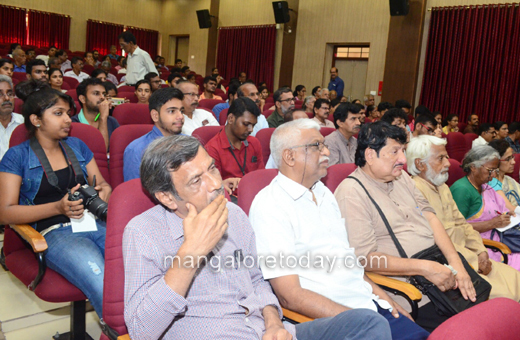 Mangaluru, 06 November 2017: “Free media can survive only when the countervailing structures of democracy act with integrity, be it the judiciary, law enforcement and investigative agencies, election commission and so on. 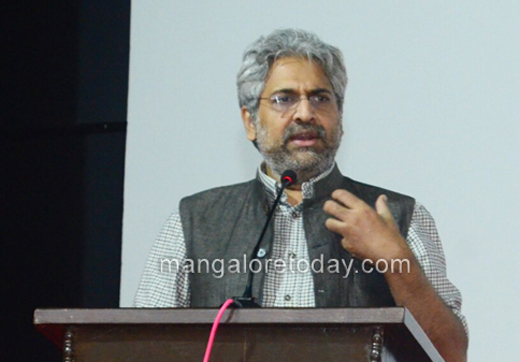 It is also essential that the broad masses in the country value media freedom as a part of the broader civic freedom,” said acclaimed journalist Siddharth Varadarajan addressing a gathering in the city on Saturday evening (4th Nov.). 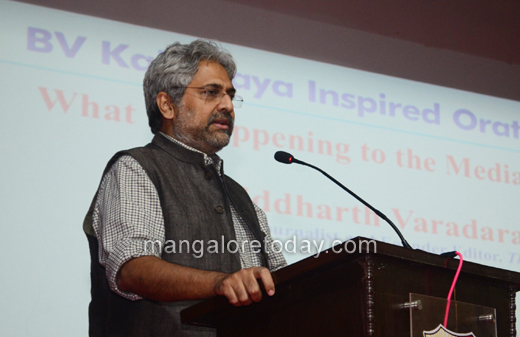 Describing the present political climate as a sort of ‘undeclared emergency’, Siddharth Varadarajan asserted that if government is pursuing a policy which is flawed, it is the job of the media to expose it. “Why should media be a caged servant? Why should giants like Times of India or Hindustan Times have to succumb meekly?” he asked. “We have one section of media which bows to the pressure, another which plays a cheerleader. The third tries to maintain middle ground and occasionally puts up an irrelevant negative story to maintain a façade of independence. It fails to ask tough questions. When Sangeeth Som raked up the Taj Mahal issue, from the overall reaction the BJP realized that this would prove to be too costly an issue and Yogi Adityanath was tasked to visit Taj Mahal and undertake a cleansing ritual. Media lapped this up and made no attempt to force the BJP to introspect. Same thing happened in Jammu and Kashmir, when a man was tied to an army jeep. These are basic questions you learn as a reporter,” he observed. Speaking in a measured and thoughtful tone, the London School of Economics graduate kept the audience spell bound for close to two hours. 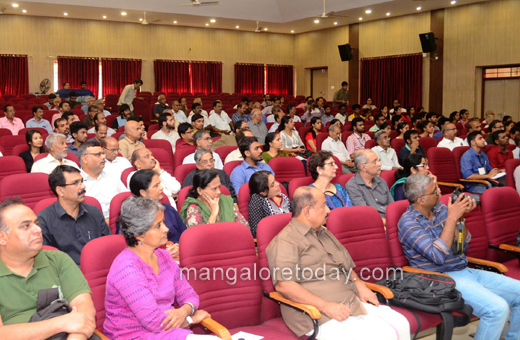 A question-answer interaction session further followed. Speaking on the Modi government’s attitude towards the media, Varadarajan said the present BJP government has largely displayed contempt for our freedoms. Freedom cannot be sustained if the articles you write are hounded with defamation suit, movies you make get held up by the censors, if books that you write are threatened with ban. This is pure intimidation, he said. “Whenever the government wants something to be done, a section of the media is pressed into service and those who do not toe the line have to face the taxman or suffer loss of advertising patronage from the government. We have legal threats, communal threats and it is becoming increasingly difficult to speak your mind. The mouth of the media is shut. But ours is not the only mouth that is shut. This is true of artists, academics, students and thinkers alike. Ever week we can see channels like Times Now and Republic take up minority issues or Muslim issues, whether it is love jihad, beef, triple talaq or something else. It is very clear that there is an attempt to create an ideological basis for communal division of the country and ensuring that people don’t ask questions about the real issues and observing that government has not delivered on promises. This is ominous. I am reminded of how the media fomented hatred and played a role in 1994 Rwandan Genocide. We should not be silent, we should register our protest,” he said. Speaking on the controversy regarding The Wire’s recent expose of BJP President Amit Shah’s son’s business dealings, Varadarajan said he could not make any direct comments on the issue as he had to obey a court injunction. “Today we have a situation where several union ministers and also an additional solicitor general on government pay want to defend the business dealings of a private citizen. Jay Shah has slapped a Rs. 100 crore defamation suit on The Wire. In the past too we have had other such instances where multicrore suits were filed and all of them are from people who are directly or indirectly connected to the ruling party at the centre. One of them Subhas Chandra of ZeeTV later withdrew the case when he realized that it would not stand legal scrutiny. The other cases too will not stand,” he said. 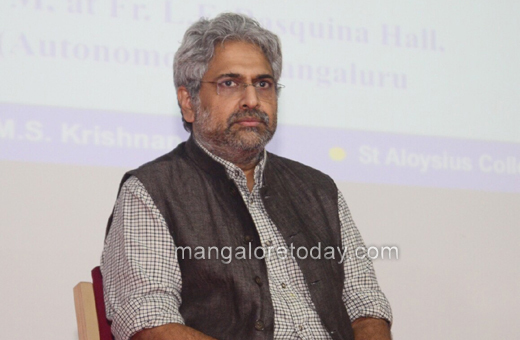 Elaborating on media freedom, Varadarajan opined that what the country needs is a media where the reader himself pays for the survival of the publication. This can create an independent media establishment which reports what others do not want to report. “With The Wire we have tried to create such a model. Three of us founders started the website investing just Rs. 2 lakh each and now it is surviving on voluntary donations from readers. When the time comes we shall invite fixed contributions from the readers to fund the venture, which is a not-for profit initiative,” he said. Observing that both USA and India are presently more or less on similar footing as far as government’s relationship with media is concerned, he said media in the USA is behaving far more maturely than its Indian counterpart. “It would be interesting to know the reason why the US media is holding its head above water while Indian media has sunk. Why is it that our media cannot take the pressure? One reason is that the democratic structure of USA is much more independent. The police, the law courts, the ministries and different administrative units act independently and cannot be subverted so easily. Another reason affecting the integrity of Indian media could be that media proprietors are unwilling to embrace the values of journalism,” he said. “There is also a need for society as a whole to value civic rights. For example, when Donald Trump sought to withhold entry visas to travelers from some Muslim nations, numerous people were stranded in American airports. During this time, scores of lawyers rushed to the airport to offer free services. Unless urban middle class speaks for the rights of the people and creates the environment, it will become more and more difficult for the media to serve the kind of role it needs to play in the type of democracy we want India to be,” he added. 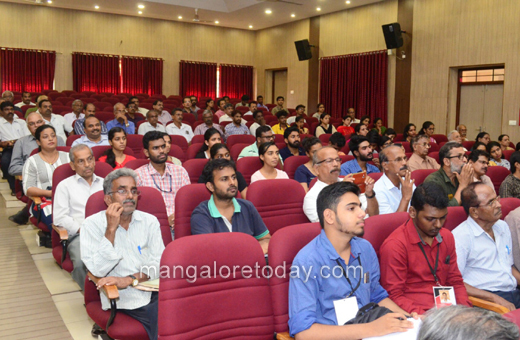 Dr Srinivas Kakkilaya hosted the oration which was organized with the support of Samadarshi Vedike, Hosatu, M. S. Krishnan Trust and St. Aloysius College. 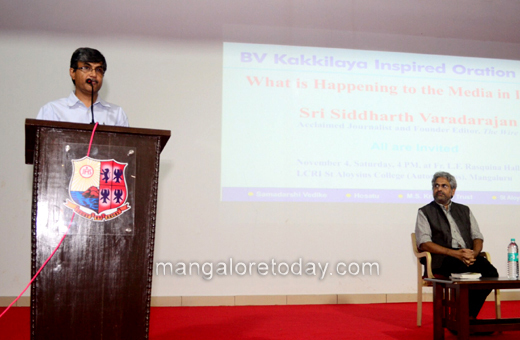 Father Melvin Pinto, Vice Principal of St. Aloysius College thanked the speaker and the gathering.